A mini calendar on the computer screen can be useful when you want to plan schedules or organize events without having to refer to another window. Besides planning and easy reference, the mini calendar can also serve as a reminder of the date for workaholics who often forget everything once they start working. Google has actually prepared a mini calendar for Gmail users to smoothen their work. A little activation work needs to be done to add this mini calendar into the main Gmail screen. To activate the built-in mini calendar in Gmail, users just need to log in to their Gmail account, click on the “Settings” link at the right top of the page. 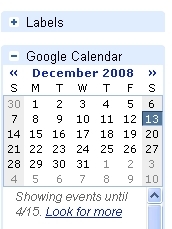 Click the “Labs” tab, scroll down the page and look for Google Calendar Gadget. Enable the function and save your changes to go back to the main Gmail window. A small pane, Google Calendar, now has been added at the left column of your main Gmail screen. At the Google Calendar pane, click the “option” and mark “Show Mini Calendar” to activate your mini calendar. The mini calendar will appear on your main Gmail screen.